German drug maker Bayer has said it will challenge India's decision to allow the production of a cheaper generic copy of a patented cancer drug. Last year, India allowed Natco Pharma to produce Nexavar and, on Monday, the patent appeals office rejected Bayer's plea to overturn that ruling. On Tuesday, Bayer said it "strongly" disagreed with the decision and would appeal in the high court of Mumbai. 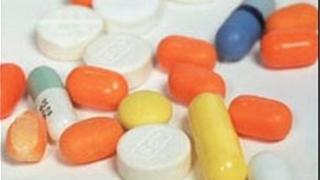 Bayer sells the drug for 280,000 rupees ($5,118; £3,374) for a 120-tablet pack. Natco says a 120-tablet pack of Nexavar will be available for 8,800 rupees ($176; £112). "Bayer is committed to protecting its patents for Nexavar and will rigorously continue to defend our intellectual property rights within the Indian legal system," the company said in a statement quoted by the Associated Press. Health groups have welcomed the decision, saying it would lead to more affordable versions of patented medicines. "The decision means that the way has been paved for compulsory licenses to be issued on other drugs, now patented in India and priced out of affordable reach, to be produced by generic companies and sold at a fraction of the price,'' Leena Menghaney of the medical charity Medecins Sans Frontieres (MSF) said. This is the first case in India of a company being granted a "compulsory license" to manufacture a patented drug. Under the rule, Natco must pay 7% in royalties to Bayer.